There are many ways to get the food of your choice: you can go for restaurants, prepare yourself at home, but also purchase it from a cool food website. The technology has grown in such a way that also food market is adopting new technologies to make it effective. In today’s world most of the people use the food websites to order what they’re getting for dinner or just to grab some information about thousands of food recipes through websites. In case of “take away” or “home food delivery online” websites, the order and payment process must be really accurate, so pay attention to the navigation and call-to-action elements. Also shapes used into the pages could help as user interface elements leading the visitor to the purchase in your food website. In case of “food recipes” website, useful to grab some information about preparations method, the main characteristics of this kind of food website are the heavy use of videos and images, so designing this kind of food website you have to design a fluid interface, possibly responsive for mobile devices, like tablets. These are just few tips useful to design a great food website and the best you can do now is to take some website design inspiration from this gallery below. 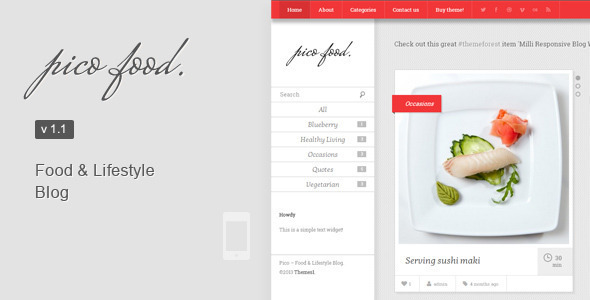 Behind each food website there’s a great imagery and a great web designer. Another great resource for your inspiration is Themeforest marketplace, where the best web designers upload some ready-made website themes, just to customize in order to impress your client with a great food website. If you click the image below you can see some food related themes. You can buy one of theme and customize it for your client. We’re going to get an affiliation for your click but we just promote what we have already tried!